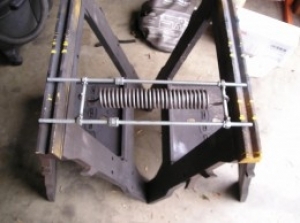 Homemade hood spring spreader intended to facilitate media blasting and powder coating operations by enabling access to spring coils' internal surfaces. Good idea. These things can be nasty if they break free from flimsy anchors.